We had a chance to talk with the founder of Descendent Studios, Eric Peterson, to discuss the vision that he has with the revival of the series with Descent Underground. Peterson also went over some of the great new additions that have been included with the latest patch. The dream is to have a fast-paced, dynamic 6DOF shooter that captures the essence of the genre. There simply hasn’t been anything like this for quite some time. Certainly fast paced FPS’s exist, but this formula seems to have been lost in time. Eric Peterson wants to bring it back, and make it a competitive choice among a landscape of multiplayer online shooters. Descent Underground won’t just be a simple remaster, but a remade glorious masterpiece. Descent was a remarkable game when it first game to being in 1995. It used a 3D environment in a way that was revolutionary for the day. While space simulators existed, no game simulated atmospheric movement in quite this way. You could move about freely and aim with your mouse, like an FPS, but you could do it in any direction that you pleased. It really did embody a shooter that was different then the rest, then the somewhat formulaic iterations of some shooter genre games we see now. At the time, Descent was fairly mind-blowing. Though it wasn’t exactly the most interesting or exciting of games to play, but the combination of space flight simulation and a first person shooter was a first, and it was definitely interesting. There was an added level of difficulty with a non-Newtonian physics based flight model and the possibility of enemies coming from literally anywhere. The originals have the kind of pace you saw in Unreal Tournament, certain modes in Quake II and certainly the harrowing speed of Quake III, still a mainstay through Quake Live. And now comes Descent Underground, the revival of a series that was never originally meant to be. It was just going to be a similar concept yet not even associated to the original IP. When Eric was approached by the current IP holder of Descent, he jumped at the chance to bring back a classic. Descent Underground, despite the shape it’s in now, isn’t going to completely forego a single player campaign. That’s on the roadmap, though it’s certainly not exactly the first thing they’re going to tackle with their small team and limited budget. For now the Unreal Engine 4 powered 6DOF shooter is being filled to the brim with multiplayer content to help bring out the inner shooter fan in you. The levels are compact underground establishments with many different compartments available to hide and play seek. Weapon and other power-ups are strewn about just as in the classics. It’s slightly claustrophobic moving around, and the normal movement physics of any FPS make it easier to fly about. Don’t be afraid to rotate and move about in any direction you choose, as it might be to your advantage. It does take some getting used to in this format, but over time the controls with a keyboard and mouse. Reviving with novel features instead of pure nostalgia. One of the features that Eric and Descendent Studios wants to have is a sort of modular approach to levels to help elicit participation from viewers. The idea is to have a game master, of sorts, that can change elements of gameplay and even the structure of the map, taking ideas from curious viewers from services like Twitch and YouTube Gaming. It’ll add a much needed element of variety that adds elements of surprise and mystery. It was almost explained in a similar way to the various “Twitch Plays” challenges that occasionally sprout up. The changes to the original formula don’t stop there, either. With the multiplayer focus that the project began with has let them build in some very interesting team-work oriented tactical designs. Ships all have different abilities, armor levels and thus can be used with unique tactical forethought. One particular ship can move parts of it forward further increasing it’s forward armored area, allowing it to be a sort of shield for the rest of the team. The dynamic, though quick and full of frantic deathmatch-like action with swift movements that need hair-trigger reflexes, but now there’s an element of strategy that can be used. Mines can be dropped as you strafe in front of people, laser nets can be deployed to trap your enemies, letting you shoot whatever missile munitions you might have picked up. 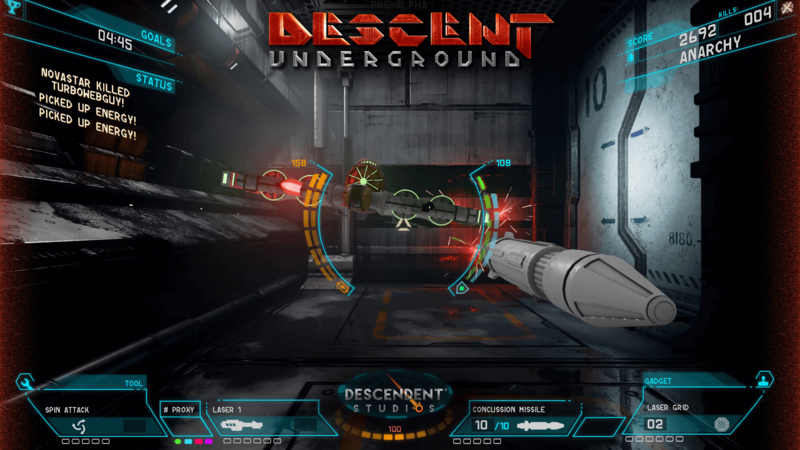 We played a private match (in which he utterly destroyed me), and what I learned is that Descent Underground has a lot of potential as both a competitive platform and as a fun game. It’s casual, something you can pick up in a pinch and play for hours because of the fast pace. It’s limited right now, with only a few levels and a few ship models, but there’s more to come. This is only the beginning, and they aren’t promising a quick turnaround either. The most immediate concerns on the developers minds are quality of life items, making things more stable, getting the servers to be more responsive. Things like that. Because ultimately they want you to have fun while playing it, with as few issues as possible, even if there are relatively few things to do. A new update added a new map and a new ship, afterburners and some under the hood refinements already. So while content is slow in coming, it’s very steady and very high quality. The aspirations are big, the crew small, but they have the talent and it’s shaping up to be a stable and very fun experience if you happen to enjoy this type of genre. If you’re too young to remember the original, that’s okay too, because it seems to have much to offer any generation of gamer. Ultimately, this is a game that has to be experienced to really be appreciated, which isn’t easy to do given that one must spend money to do so. It’s on sale, and keep in mind Steam’s return policy. But consideration should be made for such a casual yet exhilarating title. It won’t fulfill everyone’s gaming fantasy, but it might just be compelling enough. It certainly has a lot of potential. Oh, and of course, Descent Underground has experimental DX12 support as well. Preliminary tests have concluded that there’s a nice enough performance increase.